Now it's time to begin with the really fun part of this blog. As with last year, I've been searching out all sorts of interesting holiday recipes for both food and drink, along with a host of other "Christmas arcana" - from poetry and fiction to Christmas trivia and factoids, from wallpaper and Victorian postcards to classic video and music clips - and more. This year I would like to make "Old Christmas" - the traditions from way back when - a major focus of the blog. Here is a hearty brew from Athole, a mountainous region of Scotland, which may be served either warm or cold. Heat honey, and when it thins slightly, stir in cream. Heat together, but do not boil. Remove from heat and slowly stir in whiskey. May be served hot, or thoroughly chilled overnight. 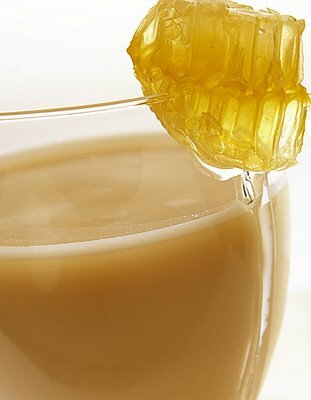 If you have some comb honey on hand, a bit of the comb may be used as a garnish, as shown in the illustration. Makes 4-6 servings. Factoid: Today Atholl Brose is sold as a liquer, containing the traditional ingredients of oatmeal water, heather honey, and Scotch whiskey, but minus the cream. Often cream is added, particularly on festive occassions. *Henceforth, all drink recipes will be clearly labeled either "alcohol" or "no alcohol."